A new paper comparing NCDC rural and urban US surface temperature data | Wott's Up With That? “A new paper comparing NCDC rural and urban US surface temperature data“. Anthony Watts reports that the denialist “think tank” Science and Public Policy has “published a paper” by retired NASA “advanced materials” physicist and self-described extremely conservative blogger Dr. Edward Long. “Published” in the sense of printed, just like Anthony’s own discredited Science and Public Policy pamphlet “Surface Temperature Records: Policy Driven Deception?” (tellingly admired by Dr. Long). Actually, this feels like a do-over of Anthony’s idea with a Ph.D. stuck on top and the really dumb bits left out. “Contiguous U.S. 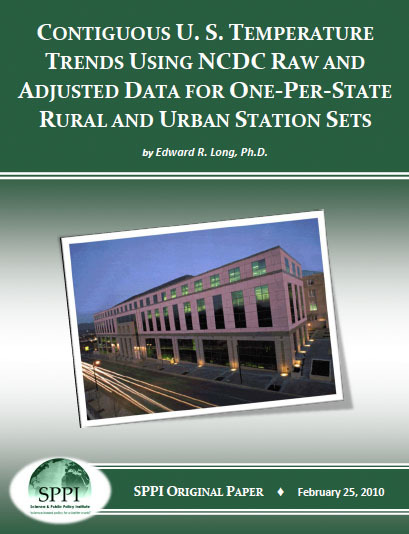 Temperature Trends Using NCDC Raw and Adjusted Data for One-Per-State Rural and Urban Station Sets“ concludes that the NCDC (National Climatic Data Center) has “taken liberty to alter the actual rural measured values.” Why? Because two 48 station subsets (“rural” and “urban”) have the same trend after the NCDC’s adjustments have been made. Which means that some nefarious trick has forced them to match. Dr. Long selected his stations “on the assumption that within a certain latitude band stations along an East-West line experience the same climate and that within a grid unit the set of stations are somehow related“. That’s a rather off-hand justification for what I suspect is a pretty careful cherry-picking operation. There have been objective re-examinations of the US surface temperature data (Menne et al, 2010), but no significant errors have been uncovered. This entry was posted in Just Keep Saying It, Misdirection, Numbers are Tricky, Self-promotion, The Cherry Orchard by Ben. Bookmark the permalink. Pingback: Contribution of USHNC and GISS bias in long-term temperature records for a well-sited rural weather station « Wott's Up With That?